Homebot is a new option in Paragon that is designed as a seller engagement tool for Residential properties (single family, condo, mobile). What is Homebot overview video! Monthly emails are sent to residential property owners – sellers, or potential sellers, providing them with a home wealth report that will keep you top of mind and provide cost saving information. Homebot provides a property specific report that provides information the homeowner will not easily find online while reinforcing you as the local market expert. With an average 58% engagement rate, Homebot will become your most valuable tool to market and maintain seller relationships. It will also show you who opened their report and how many times it was opened. Homebot has been integrated into the “Contacts” section in Paragon for ease of use while giving you maximum marketing potential. Connect a new or existing contact to Homebot within Paragon (you will see the Homebot icon next to the fields that should be populated), or enter the address directly into Homebot to get started. In addition to the monthly reports, Homebot provides 3 preformatted social media posts and an individualized landing page for online lead generation. With packages starting out at $25 per month for 500 contacts, it is very affordable and will engage more sellers. You can sign up for your free 7-day trial under the “Contacts” tab in Paragon or attend a webinar to learn more. To see what Homebot has to offer, click on the image below for an overview. Upcoming Homebot webinars are posted on the NEREN Training Calendar accessible from your NEREN Dashboard. This entry was posted in Homebot on March 12, 2019 by nerenmlsblog. With Homesnap Pro, you can get the NEREN® MLS information on any device, wherever you are! Click here to learn more about Homesnap. I belong to more than one MLS; how do I add the other MLS to my profile? This entry was posted in Homesnap, Member Benefits and tagged Homesnap, Homesnap App, Homesnap NEREN MLS, Homesnap Pro on January 30, 2019 by nerenmlsblog. The NEREN® MLS is pleased to announce a new relationship with Homesnap! Homesnap is a third party real estate search platform for people to explore homes and search real estate listings online at www.homesnap.com or from a mobile phone, via the Homesnap app. In addition to providing a website or app experience, the information available to a consumer is also different from that of an agent of a participating MLS. Known as Homesnap Pro, an agent of NEREN may set up their Agent Account and have access to Active, Active Under Contract, Pending and Closed MLS listings in real-time, and many other agent-only features that will be highlighted in future communications. Because ‘Pro’ is only for agents of participating MLS’s, MLS listings will be available in Homesnap Pro. Consumers have the option of going to homesnap.com or to download and use the Homesnap app to search for Active and Active Under Contract listings. If you wish for your listing(s) to be available to consumers for search and display via Homesnap, you will need to authorize the MLS to distribute your listing(s) to Homesnap. 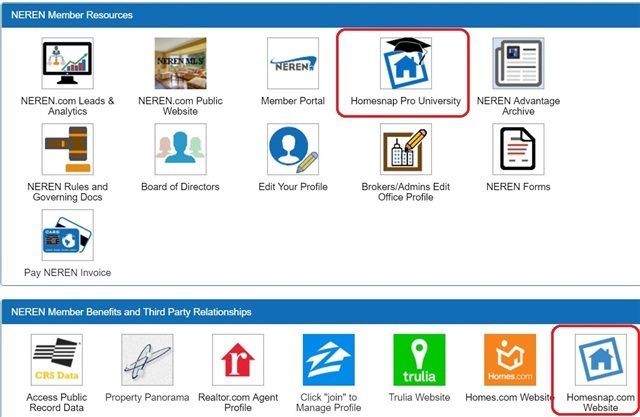 To enable your office to send listings to Homesnap, you will need to log into nerenmls.com, and on the Dashboard, click on the “Brokers/Admins Edit Office Profile” tile. 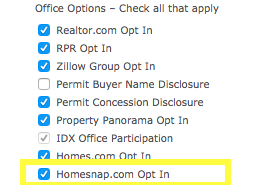 You will then need to check the box as shown below, to “opt-in” to send your office’s listings to Homesnap for consumers to search/view. 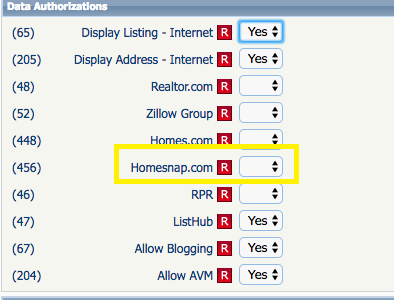 There is another switch in Listing Maintenance so that if an office has selected to send listings to Homesnap and a seller does not wish for their listing to be marketed to consumers on Homesnap, there will be the option to select “No” in the Homesnap.com data authorization as shown below. If your seller does wish to send their listings to Homesnap, then please select “Yes”. This entry was posted in Member Benefits and tagged Homesnap, Listing Syndication on January 30, 2018 by nerenmlsblog. Introducing Homesnap – A Free Member Benefit! The NEREN® MLS is pleased to announce a new free member benefit – Homesnap! Homesnap is a third party real estate search platform to explore homes and search real estate listings online at www.homesnap.com or from a mobile phone, via the Homesnap app! We are pleased to announce the availability of NEREN listing data to members in Homesnap as of Wednesday, January 24, 2018! In addition to providing an app or website experience, the information available to a consumer is also different from that of an agent of a participating MLS as described below. Known as Homesnap Pro, an agent of NEREN may set up their Agent Account and have access to Active, Active Under Contract, Pending and Closed MLS listings in real-time, and many other agent-only features that will be highlighted in future communications. Because ‘Pro’ is only for agents of participating MLS’s, no action is required for your listings to be available in Homesnap Pro. This information is available in the Homesnap App, or by logging into the homesnap.com website. And much more. Click here to learn more about Homesnap. Consumers have the option of going to homesnap.com or to download and use the Homesnap app to search for Active and Active Under Contract listings. If you wish for your listing(s) to be available to consumers for search and display via Homesnap, you will need to authorize the MLS to distribute your listing(s) to Homesnap. As with other third party websites, the office first has to opt-in to permit your listings to be distributed to Homesnap. If your office has opted-in, and you wish for your listing to be available for search in Homesnap, you will need to select “Yes” in the Data Authorizations section of listing maintenance in Paragon. How do I learn more about Homesnap? Additional information can be found on the Homesnap page under Member Benefits in your Member Portal by clicking here. In addition, there are NEREN specific webinar training events that have been posted on the NEREN Training Calendar, or you can click on a link below to register. You can also visit the Homesnap Pro University anytime! This entry was posted in Member Benefits on January 30, 2018 by nerenmlsblog.